Keeping track of all of the things that are going to happen over the course of a school year can be exceptionally easy. One of the best ways to do this is with the use of this Academic School Calendar. 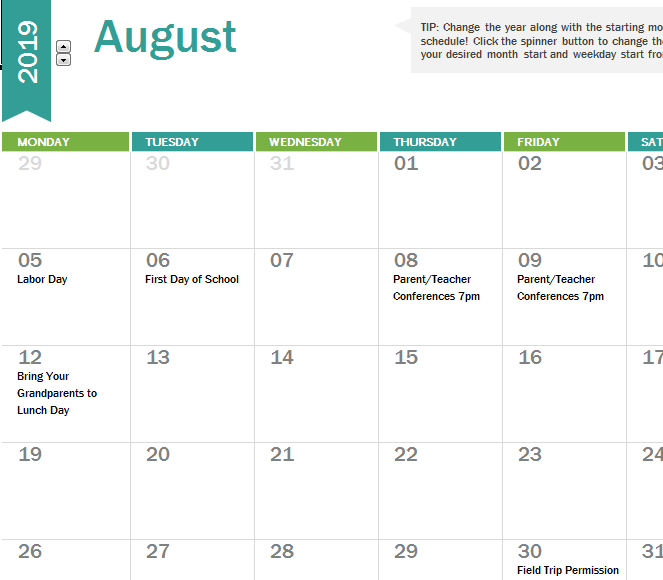 This Academic School Calendar template is something that can be used by teachers, students, and parents. It is even possible to use an academic calendar to keep track of the needs of home-schooled children. One excellent thing about this Academic School Calendar is that it is completely free to download, and it can be customized for any school schedule. It is also possible to put a huge amount of information on this calendar. One excellent thing about this academic calendar is that it is possible to change it to reflect the class schedule. It is possible to format it so that different days are different colors. This means that you can have days that school are dismissed one color, and then you can have days that where it is dismissed early a different color. It is even possible to have different colored days for activities that are only held a couple of days a week. It is even possible to customize the template so there is space to write down invents that occur for an entire week at a time. This is great, because there is a very good chance that that events don’t frequently happen on Saturdays and Sundays. It is possible to change this Academic School Calendar so the spaces are as big or small as you want. This means that you can put down all of the information you want on it. It is also possible to make it so the template contains printed information, and so there is extra space where a person can write down information by hand. This can allow for changes, and it is even possible for a student to regularly write down things like what reading they need to do on each night. I think this template is wonderful. I haven’t found anything comparable design-wise online. Is it possible to extend the calendar into the month of June? I tried copying and pasting a month towards the bottom, but it doesn’t allow me to move the reset dates. Simply click on the first month in the spreadsheet. You’ll see an arrow for a dropdown menu to the right of the selected cell. Click it, pick June, and your template should change to meet your needs.